One of France’s great winemakers, Olivier Leflaive, talks about his wines, his restaurant and hotel in Puligny-Montrachet, and shares a few of his favorite summer dishes with Sophie Menin. The vines at Olivier Leflaive in Puligny-Montrachet grow quickly during the first weeks of July, up to 12 inches in 24 hours. Vineyard workers who have just completed clipping unruly tendrils move on to tying new shoots to the trellis system, so that tractors may pass between the vines without snapping the stems. Last week, Puligny-Montrachet narrowly missed the season’s first hailstorm, which hit Beaune six miles to the north and a heat spell caused the grapes to swell. The winery team presented the 2008 bottlings to local winemakers—an annual tasting that kicks off the summer season, providing a chance to catch up, open a few bottles and receive an honest critique from those who know the region best. With all this going on and more, Olivier Leflaive spent hours each day visiting his restaurant, hotel, and wine workshops, encouraging lay enthusiasts to forge an intimate bond with his wines and vineyards. Olivier Leflaive is Burgundy’s least likely troubadour. His family has been making wine in Puligny-Montrachet for 18 generations. He could probably sell all his wine without meeting a single customer. Yet, a simple search of YouTube finds him playing guitar in a straw hat under a stone arch with golden leaves of Chardonnay vines climbing up to his stomach, while presenting Puligny-Montrachet and the wines of Burgundy as if they were an extension of himself. Like the best folk singers, he lures his listeners in as he introduces his passions: the eternal calm of Puligny-Montrachet; the delicate balance between the clay soil that lends power to his wines and the limestone soil that imbues them with elegance and finesse; and the importance of tasting wines over a leisurely dinner or lunch. • Sophie Menin: Dinner Under the Midnight SunOlivier has worked the harvest since he was 15. He learned to make wine by tasting with his uncle and father. To him, sensitivity in the mouth is the most important skill winemakers can possess. It enables them to forge a relationship between their sense organs and winemaking’s more technical aspects. Olivier works with his oenologist and technical director to maintain his family’s house style, favoring finesse and elegance over power and extraction. In the winery, this means long, temperature-controlled barrel fermentation, not too much stirring and judicious use of new oak. In the glass, this translates into liveliness on the palate and flavors with pinpoint clarity and persistence. His devotion to revealing the nuances of Burgundy’s appellations extends far beyond industry professionals, connoisseurs, and major collectors. “Wine professionals may know how to taste a hundred wines every day, but it is not easy for most people. I sought a way for people who wanted to know more about Burgundy to have more time here, to create a place where people could have a two or three hour dinner or lunch and taste 14 or 15 wines slowly and calmly,” he says. Sixteen years ago, Olivier opened La Table d’Olivier Leflaive, a restaurant he visits each day during lunch and dinner service. It operates in the fashion of a traditional table d’hôte, with a fixed menu and simple seasonal dishes typical of Burgundy. A summer meal might include gougéres, gazpacho, tuna persille, chicken, two cheese courses, and chocolate mousse. What makes the experience singular is the fact that the meal is accompanied by 14 wines poured by knowledgeable sommeliers committed to engaging guests in discussion. It may begin with a Rosé and Chablis, introduce Chardonnay gems from lesser-known appellations such as Rully and Auxy-Durress, progress to iconic wines from Chassagne-Montrachet, Mersault, and Puligny-Montrachet, and conclude with Pinot Noirs from village and premier cru vineyards in Pommard. In 2008, the restaurant moved to the ground floor of a stone house on Puligny-Montrachet’s main square, La Place du Monument. The floors above the restaurant were converted into Maison Olivier Leflaive, a chic boutique hotel with 13 rooms and an interior garden. With the new enterprise, Olivier solidified his role as Burgundy’s premier ambassador. He organizes visits for guests with vintners across the Cote d’Or, as well as golf, bicycle, and balloon excursions. He also offers daily workshops, where guests can experience firsthand how wine is made from vine to barrel, and participate in the season’s work—be it pruning vines, picking grapes, or punching down the pomace cap. Olivier likes to say that Puligny-Montrachet is one of the last villages where there are no tourists, only wine lovers. Physically it has not changed in 200 years. In the autumn, everything is gold. In the winter, it is stunning when it snows. In the spring, one can see nature up close as baby leaves grow. In the summer, the grapes mature. With their income from wine, people keep their houses beautiful. From Puligny-Montrachet’s vineyards, Olivier can see the bells on the church in Mersault to the south, and the bells on the church in Chassagne-Montrachet to the north. In between, everything is planted. His gaze digs down from the view of the vines to the land they are planted on. While they are all 100 percent Chardonnay, the slightly higher proportion of clay in Chassagne gives a mineral-driven wine; the brown limestone and blue marl in Mersault produces wines that are more powerful and fruity; the balance between the two terroirs lends Puligny its finesse and characteristic floral scent. Tasting his Chassagne-Montrachet, Mersault, and Puligny-Montrachet side-by-side, it is difficult to believe the vineyards are only a few miles apart. Olivier makes 2,400 barrels of wine each year from 65 different appellations across Burgundy. Where he does not have his own land, he buys grapes from farmers with whom he works year-round to ensure high standards. He refers to his barrels as “babies” and tastes from them regularly, because every year, each wine has a slightly different evolution. On summer nights at 8:30, Olivier leaves the winery, restaurant, and hotel behind and returns home to have dinner with his wife and family. When there is good weather, he will barbecue, or if he is lucky, his wife will make him gazpacho and salad of crab, mango, avocado, and fresh herbs. When he is not drinking Burgundy wines, he might open one of the highly perfumed whites of Condrieu in the Northern Rhone or a dry Riesling from Alsace to go with his salad, or a red from the Côtes du Rhone to go with his barbecue. No matter what he pours, the next morning he will be at Maison Leflaive at 8:30 sharp, to greet his guests and introduce them to his first love, the wines of Puligny-Montrachet and the Côte de Beaune. These featherweight savory gruyere-laced pastries are ubiquitous in Burgundy. In a large saucepan, combine the water, butter and salt. Place the pan over medium heat until the butter melts and the mixture begins to boil. Remove the pan from the heat. Immediately add the sifted flower. Stir vigorously, using a wooden spoon, until the mixture pulls from the sides of the pan and begins to form a ball in the center. Continue to stir for another minute. Let the mixture cool for 5 minutes. Add 4 eggs, one at time. Using either a standing mixer with a paddle attachment or a wooden spoon, thoroughly incorporating each egg before adding the next one. The dough should appear glossy and just stiff enough to hold a soft peak. Add the cheese, nutmeg and pepper. Gently stir. Lightly butter two sheet trays, or line them with parchment paper. Using 2 teaspoons, drop 1-inch mounds of batter, leaving sufficient space for the gougéres to expand and puff. Beat the remaining egg in a small bowl with a teaspoon of water. Brush the mounds with the egg wash. If you have a little extra cheese, sprinkle it on top. Place the sheet trays in the center of oven and bake for 25-30 minutes. The gougéres are finished when they appear crisp, golden, and puffed while their interiors remains slightly soft. Serve warm. This simple summer terrine is a signature dish La Table d’Olivier Leflaive. In a large mixing bowl, combine the tuna, vinegar, cream, parsley, salt and pepper. Set the tuna mixture aside. Pour the water, wine and Madeira into a large saucepan and set the pan over a medium-high flame until the water comes to a boil. Reduce the heat to medium and simmer for 2 minutes. Reduce the heat again, this time to low, and add the gelatin. Using a wooden spoon, mix constantly until the gelatin dissolves, approximately 3-5 minutes. Add the contents of the saucepan to the tuna and stir. Pour the mixture into a 12-inch terrine dish. Cover with plastic wrap and refrigerate for at least six hours. When the terrine is firm, run a thin blade around the perimeter of the dish and turn it onto a large plate or attractive cutting board. Slice and serve cold. This elegant salad makes for a refreshing light supper on a warm July night. To round out the meal, end with a creamy washed-rind cheese from Burgundy, such as an Affidelice or Epoisse. In a medium-sized mixing bowl, combine the mango, half the shallots, 1 tbsp. chervil, the juice of half of a lime, 1 tbsp. olive oil, a pinch of salt and a few grinds of fresh pepper. Use a fork to gently combine and set the mixture aside. In a separate bowl, combine the crabmeat and 2 tbsp. of olive oil. Set aside. Use a ring mold or an 8 oz. deli cup to compose the salad. Begin by spreading 1/4-cup of the mango mixture in an even layer. Working from the outside to the center, lay half the avocado slices in concentric circles so that the slices look like the leaves of a flower from above. Distribute 1/2-cup of the crabmeat over the avocado. Gently press the salad into the mold. In a large mixing bowl, use a whisk to combine the remaining shallots, 1 tbsp. chervil, the juice of half a lime and a pinch of salt and pepper. Add the 2 tbsp. of olive oil, whisking constantly. Then add the fennel and gently toss. To serve, place a flat plate over the open end of the mold. Holding the plate and mold together quickly turn the mold over and set the plate on the counter. Give the mold a few taps to loosen the salad and remove. Compose the second portion. Garnish the two plates with a mound of the fennel salad and serve. Sophie Helene Menin writes about food and wine, sense of place and the pleasures of the table. 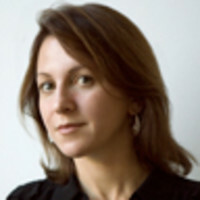 Her work has appeared in The New York Times, Departures and Saveur, among other publications. She lives in New York City.